Are you ready?! It's time for Simply Fit Challenge #1! Every Simply Fit Challenge has a theme. Increase something, and at the same time decrease something. It might relate to food, it might relate to exercise. We hope all these challenges give you a little "jump start." Is each little goal all you will do towards healthy living? I hope not! Keep exercising. Keep trying to eat right. If you're not already doing something, get off the couch and pop in a workout DVD or go on a walk! For the next 2 weeks we challenge you to simply work on increasing water and decreasing sugar. Headed to grab a Coke? Fill your water bottle instead. Wanting to open the Oreo cook package in the pantry? Drink a tall glass of water. Got the afternoon munchies and wanting a sugary treat? Fill your water bottle and walk out of the kitchen! Heading to Starbucks and wanting a latte? Order a tall Americano and ask for ice water as well! Trust me - I'm needing this challenge just as much as you are. We ALL need to drink more water and walk away from all the sugary drinks and food. I'm a sucker for those afternoon munchies. But for the next 2 weeks I'll be here working on my water drinking habit. How much water should you drink? Drink off and on all day, and your best indicator is if your pee is clear. We have a Facebook Group for accountability. Join HERE! Post your water drinking pics on Twitter & Instagram and add #simplyfitchallenge to your post so we all can find you. Let's cheer each other on! 1. Make a schedule for the next 2 weeks of when you'll make time for exercise. Start with just 4-5 days a week. Schedule it and make it happen! Deal? 2. Spread the word and find an accountability partner to join you on these little challenges. Daily exercising with my hubby and keeping track of my workouts in an accountability fitness group online has been critical for me. Need some ideas on how to make time for your workouts? Read my ideas HERE. For some Beginner Fitness Tips read THIS. 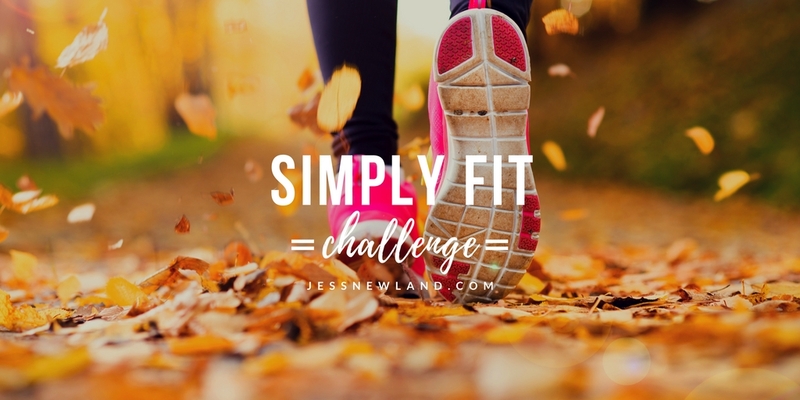 What is the Simply Fit Challenge? Every two weeks we'll introduce a new goal to work on. Each challenge will focus on a different area to INCREASE and DECREASE. Follow along and hopefully by the time the New Year comes around you'll already be way ahead of everyone else who is trying to just begin to set their weight loss resolution goals. Need help choosing a workout program that's right for you? Fill out the Contact Form in the right sidebar and I'd be happy to help.